I'm a big advocate for food. It's not just that I like to eat or that I enjoy making healthy eating a part of our lives at Chez Mocha Momma, it's that I got to see first-hand what hunger really does to children while I was in Africa back in October. Now, I'm helping to promote the Fill the Cup program to make people aware of what is really at stake. I'm also no stranger to hunger. Maybe I've mentioned before that being a teenage single mom wasn't the most glamorous or prosperous way to begin my family, but that's how it went and I spent many years creatively coming up with solutions to feeding my daughter. My favorite, and perhaps the one that worked best, was taking her with me to bar/grill restaurants during Happy Hour. Yes, that Happy Hour. The one where all the kids who just turned 21 spent time on quarter beers and ate all the free hot wings and sliders and mozzarella sticks they could eat. Mallory was about 4 when I started taking her to a place called Stix (it was also a pool hall, I WAS A BRILLIANT YOUNG MOTHER I TELL YOU). We'd go in right about 4 and I would buy her a Coke and sit with her at a table in the corner so as not to disturb those getting their drank on, and that's how I fed her for free. Because I was a diligent young mom I made her eat the carrot sticks and celery that comes with hot wings because, duh, vegetables, people. Maybe not my finest moment, but it worked for us and my kid wasn't hungry. She also came out of her shell a bit when we stayed a little longer than usual one night and karaoke began. Drunken college kid karaoke is kind of a right of passage but I never sang or left her alone at the table because it was, of course, really a bar atmosphere. Except, one night she decided after feasting on her appetizer-style dinner, that she'd like to sing "A Few of My Favorite Things" from The Sound of Music and let me tell you, an adorable little 4-year old in a bar singing a song made famous by Julie Andrews as Maria Von Trapp is the absolute cutest thing I've ever seen in my whole life. I'm not ashamed to admit that she brought the house down with her little number. Afterward, we walked home and I thought I'd been a pretty good mom to be able to give my child a hot meal and help her performance skills. Really. It's just one of my favorite things about being a creative young mother. But hunger isn't always that cute and it doesn't always end with Maria Von Trapp numbers. Life isn't a musical and hunger isn't fun. With so many hungry people in the world we have a lot at stake. As a part of some of the changes I've made in the last year to be more of the change I want to see in the world, I've teamed up with a few key players who are making things happen. First, it was with ONE.org to see what foreign aid looks like on the ground. I also joined the Blogger Council of my local food bank, the Central Illinois Food Bank, at the invitation of their social media director. I'm hoping to shed light on filling that little red cup up there. 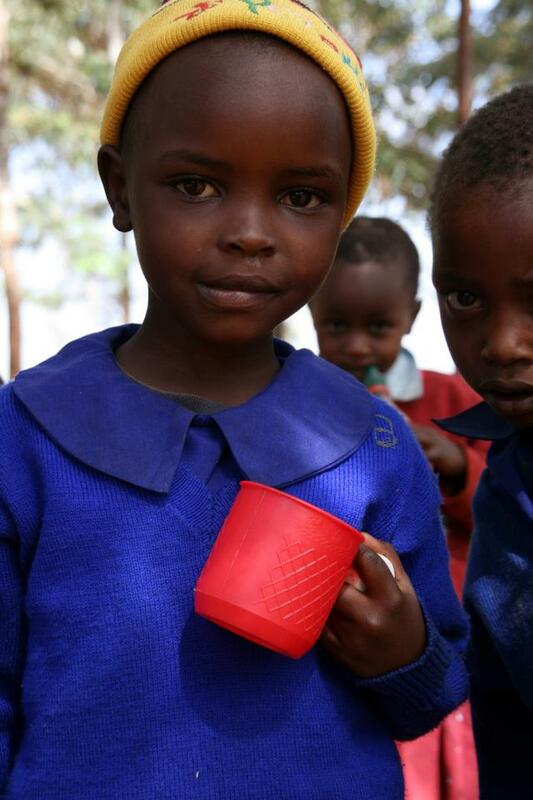 “Filling the Red Cup to Fight Hunger” will feed a child for 25 cents and then the child eats from the red cup. Hunger, and I don't think this is widely known, is a solvable problem. You. You're my favorite. I really like you the best. If you decide to write a post of your own or even share this within your social networks (Twitter, Facebook, Google+, Instagram, etc...) please let me know because I can thank you and dedicate one of my donations to my local foodbank in your name. Won't you help me share the Red Cup and the World Food Program? I partnered with The Mission List to help spread the word about this worthy program. All opinions and musical numbers are my own. You know I will take this on. As I've learned, hunger is not simply about empty bellies. It's about bodies and minds that will not reach their full potential without adequate nutrition. I look forward to spreading the word, and I'm honored to be called out by you, one of my favorite people too.